The first thing drivers in our state say is “I shouldn’t pay more – our gas tax is already too high.” It is true that when you cross into Virginia or South Carolina, there is a drop in the gas tax and the price at the pump. But, that’s because in our unique state, we pay for transportation primarily in gas tax, not in other sources. 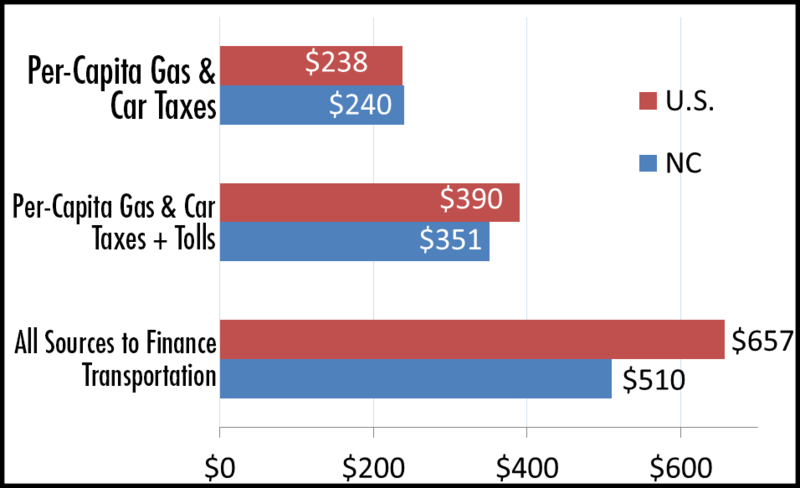 To truly compare apples to apples, you have to look at all the fees and taxes – like property taxes, local fees, tolls, etc that OTHER STATES have in addition to the gas tax. When all the fees are combined, North Carolinians actually pay about $510/year per capita – compared to the U.S. average of $657. Since 2007, NCDOT has been thoroughly engaged in a Transformation plan to completely overhaul the organization. Hiring an external management consultant, they set about to determine a new strategic blueprint, project prioritization, performance metrics and more. NCDOT also took a hard look at its staff to determine where reductions could be made. One outcome since 2010 alone is the reduction of more than 2,300 Full-Time positions from the organization. Starting in 2013, Governor McCrory and NCDOT began a process of streamlining how transportation projects were selected and paid for. Passed by the General Assembly that year, the Strategic Transportation Investments (STI) Law enables NCDOT to maximize North Carolina’s existing transportation funding to enhance the state’s infrastructure and support economic growth, job creation and high quality of life. STI establishes the Strategic Mobility Formula, a new way of allocating available revenues based on data-driven scoring and local input. STI re moves politics from the selection of transportation projects – no more “pork” for legislators districts because of influence. And, STI takes a hard look at data – economic value, job creation, traffic reduction and more – in assessing which projects advance. In December 2014, the draft 10-year State Transportation Improvement Plan was released. The plan includes 1,100 projects across all transportation modes, covers every county in the state, and will create 300,000 jobs.